Any registered voter may vote by absentee ballot. Absentee ballots for federal/state elections are mailed to eligible voters 25 days before election day. Fill out an Application for Absentee Ballot. An application may be mailed, or dropped off at the county election office. Applications must be received by the county election office by noon the day before the election. If you drop off the application you will be able to pick up the absentee ballot at the same time. 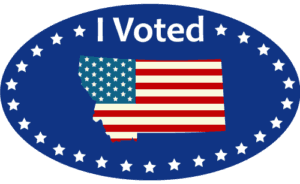 An absentee voting packet will be mailed to the address you indicated on your application, or you can pick up the packet at the county election office at the time you apply for the absentee ballot, if ballots are available at that time. After voting the absentee ballot, return in the envelope(s) provided. READ INSTRUCTIONS INCLUDED WITH THE PACKET CAREFULLY. You can also view or print federal/state election absentee voting instructions. Be sure to sign the affirmation on the return envelope before sending back or dropping off. Note: The person to whom the ballot was issued must be the person signing the return envelope. Absentee ballots must be received at the election office or polling place by 8:00 p.m. on Election Day. Absentee turnout from 2000 through the present is available. For more information about voting, call your local election office or call the Secretary of State’s toll-free voter hotline: 1-888-884-VOTE (8683).